Rug pads for hardwood floors are a very important purchase. The wrong rug pad can permanently damage your floor. Many unsuspecting homeowners end up with stained, severely discolored floors due to a chemical reaction between the rug pad material and the polyurethane finish. Area rug pads are frequently mislabeled or even misrepresented. You will see many marked as “for use with wood floors” or “for use on hard surfaces” when, in fact, they are not safe for a poly-coated wood floor. Rug Pad USA will custom cut their rug pads to fit your exact dimensions – free of charge. They are made in the USA and come with a 20-year warranty. Durahold Plus is recommended by hardwood floor manufacturer’s Bruce and Shaw & Mohawk for use on their floors. They will also custom-cut your rug pad at no charge. * Note: Custom-cut rug pads cannot be returned. First, measure the width of the rug. Include binding along the edge in your measurement. Second, measure the length of the rug. Include any binding but DO NOT include fringe or tassels. The result should be the exact size of your area rug. Provide your retailer with these measurements and request that your rug pad be trimmed slightly less on each side for a proper fit. Rug pads for hardwood floors are marketed to consumers with a primary focus on comfort and anti-slip properties. Your first priority should be to ensure that the materials they are made from will not damage your flooring. Then make sure they are dense enough to protect your floors from punctures and dents. Next, consider safety and the amount of grip a rug pad provides. Last, select a pad for comfort. 100% felt pads are a great option for adding cushion. For an inexpensive and temporary option, you can use Rebond Padding made from recycled scraps of foam between 3/8″ and 7/16″ in thickness. But be cautious. Check with the retailer to ensure the rebond does not contain Butylated hydroxytoluene (Bht) – which is sometimes used as a flame retardant. It can cause yellowing of your floor’s surface. Cut the pad an inch or two smaller than your area rug and use carpet tape on the seams to hold the rug and pad together. A satisfactory option is Polyurethane Padding. It is reusable and has a lot of cushion. Poly rug pads are made from a mix of small fibers pressed into a thin roll of fiber material. One last suggestion is Fiber Padding made from recycled polyester fibers. 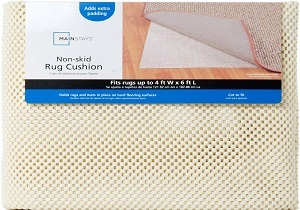 This type holds up well and works great under area rugs to prevent movement, but it isn’t as comfortable. Choose from synthetic fiber or recycled textile fiber. Steer clear of most rubber, foam-backed, latex, vinyl, plastic-matted or non-ventilated rugs and padding. Some rugs are made of PVC (vinyl) that contain plasticizers which can discolor the finish or the wood. The damage is permanent and it’s not a pretty sight. Your floors need to breathe. In particular, there is a popular anti-skid synthetic rubberized product similar to what is used for lining shelves and drawers. 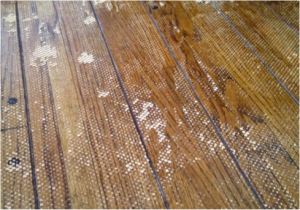 It leaves an irreparable and very distinct crisscross, grid, or egg crate pattern on your hardwood floor. Unfortunately, some carpet and general flooring stores will recommend this type of padding to their customers. Again, product labels can be misleading. The label on the product displayed above says it’s for ‘hard flooring surfaces’. Don’t take the chance with this type of pad if you’re not absolutely sure it won’t react negatively with your floor finish. Pictured here is an example of the irreversible damage they cause. A simple buff and re-coat won’t repair it. The “rug pad stain” has to be sanded off, which means huge time and expense in fully sanding and refinishing your entire floor. Similarly, there are bathroom-style rugs with a certain type of rubber backing known for yellowing linoleum and vinyl flooring. They also permanently discolor hardwood floors. Lastly, do not use a stiff pad with hard cleats or grippers. Many people like to use these near entrances in or out of the home, but they can cause permanent indentations in the wood. Think of area rug pads as valued pieces of furniture as well as quality-of-life improvements in comfort and safety. Our top two recommendations are specific products by Durahold Plus and Rug Pad USA . Lower-quality pads or those made from improper materials will need to be replaced frequently or will permanently damage your floor. An investment in high-quality area rug pads appropriate for polyurethane-coated hardwood floors will pay for itself over time.